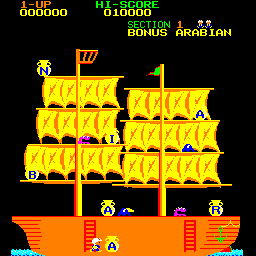 You control the little guy in the turban whose mission is to collect the large pots with letters on them to spell "Arabian". He can run, crawl, jump the gaps, climb ladders and vines and kick the monsters off the screen. You must negotiate you way around the platforms collecting the pots in order to advance to the next stage. 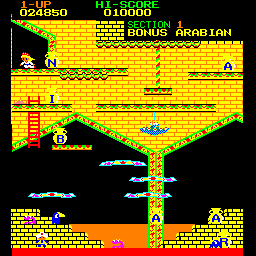 You score a bonus if you collect the pots in order, lighting up the word ARABIAN at the top of the screen as you go, but you still clear the screen even if you do not collect all the pots in order. Your main adversaries are the blobs and the crows. The blobs move fairly slowly as they walk around the screen intent on calling you, but they do have the abillity to jump up into the air to avoid your kicks. The crows obviously can move up and down the screen as well. If you kick an enemy off screen it reappears somewhere else on the level after a few seconds. As the blobs appear you can walk through them until they are fully formed, but as soon as they start moving their touch is deadly. There are also occasionally mutated blobs which appear if you take too long between collecting pots. These home in on your position very quickly, flying directly towards you through any obstacles in their way. You score a good bonus if you manage to kick a mutant blob off the screen. 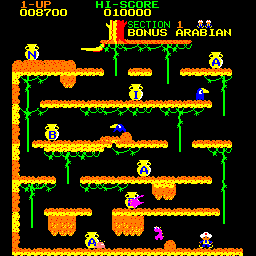 From the third stage onwards you have to negotiate your way up the screen using magic carpets. You can stand on the carpets and you float across the screen, but you cannot move off screen on a carpet. You must jump from carpet to carpet to make progress, but you can be knocked off if hit by the carpet above. You do not lose a life for this, but you fall down and must start your ascent again. Each stage is also played against a time limit, and the letters at the top of the screen gradually turn into skulls. When all the letters change you lose a life as the clock runs out. You start the game with 3 lives and an extras is awarded for 20,000 points. Scoring Kicking a monster off screen: 100 points. Killing 2 monsters with one kick: 600 points. Kicking a mutant blob: 2,000 points. Collecting a pot: 500 points. Spelling ARABIAN: 4,000 points bonus. Try to kick off the monsters in pairs for more points. They don't have to be close together: one hitting another knocks the other off screen. Don't move through a crawlway when there is a blob regenerating on the other side. You move much slower when crawling, can't kick and chances are you won't make it through in time. You can kick monsters slightly above and in front of you if you kick when jumping. If you jump onto a ladder you land on it half way up and can then continue climbing, thereby getting you up quicker. You can't jump when there are vines above you as you cling to them.